Averages do not tell us everything about a sample. Samples can be very uniform with the data all bunched around the mean (Figure 1) or they can be spread out a long way from the mean (Figure 2). The statistic that measures this spread is called the standard deviation. The wider the spread of scores, the larger the standard deviation. 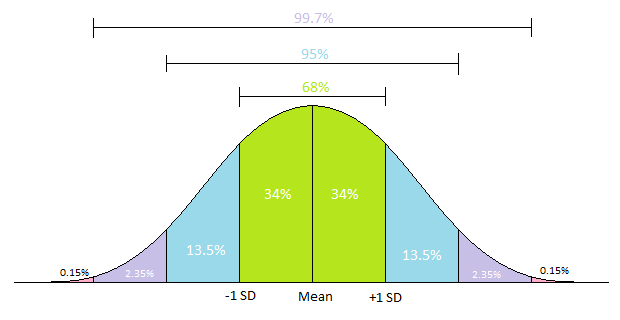 For data that has a normal distribution, 68% of the data lies within one standard deviation of the mean. ​In our class, the formula we'll want to use is =STDEV(A1:A100). Replace A1:A100 with your data by highlighting the cells with data you want to include in the standard deviation calculation. Once you have the mean and standard deviation, you need to make sure that you set the values to the correct number of digits. EXCEL will default to giving you too many numbers after the decimal place. Your mean and standard deviation must have the same precision (number of digits after the decimal) as your data points. So, the example, the standard deviation should be a whole number. To do this, click the box which is displaying the standard deviation and on the "Home" tab click the decrease decimal button until you have the correct number of digits showing.